Tremendous atmosphere in The Cirkus: band, sound, lights all great, and audience vociferous from the outset. 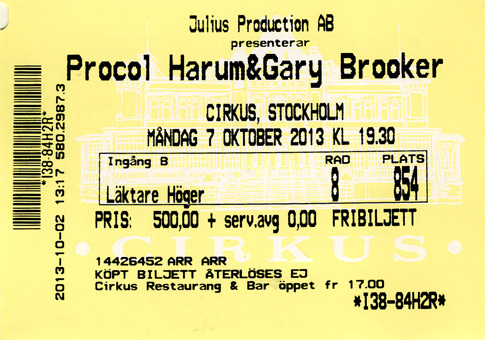 An absolutely excellent Procol Harum show in every respect: marvellous selection of tunes (only one album not represented): altogether a masterful presentation -- the better for a fully-functioning Hammond rig.. Hilarious times backstage, specially when GB demonstrated his vocal warm-up technique: 'I cough once, I sing Octopus's Garden very low ...' (it really was) ' ... and then I say "Show's on"!'. Presence of high-spirited Scotsmen, Gordon and John, contributed a lot to the brio also.